The Cleveland Museum of Art (CMA) is an art museum in Cleveland, Ohio, located in the Wade Park District, in the University Circle neighborhood on the city’s east side. Internationally renowned for its substantial holdings of Asian and Egyptian art, the museum houses a diverse permanent collection of more than 45,000 works of art from around the world. The museum has remained historically true to the 1913 vision of its founders, keeping general admission free to the public. With a $755 million endowment, it is the fourth-wealthiest art museum in the nation. With about 705,000 visitors annually (2016), it is one of the most visited art museums in the world. The Cleveland Museum of Art was founded as a trust in 1913 with an endowment from prominent Cleveland industrialists Hinman Hurlbut, John Huntington, and Horace Kelley. The neoclassical, white Georgian Marble, Beaux-Artsbuilding was constructed on the southern edge of Wade Park, at the cost of $1.25 million. Wade Park and the museum were designed by the local architectural firm, Hubbell & Benes, with the museum planned as the park’s centerpiece. The 75-acre (300,000 m2) green space takes its name from philanthropist Jeptha H. Wade, who donated part of his wooded estate to the city in 1881. The museum opened its doors to the public on June 6, 1916, with Wade’s grandson, Jeptha H. Wade II, proclaiming it, ‘for the benefit of all people, forever.’ Wade, like his grandfather, had a great interest in art and served as the museum’s first vice-president; in 1920 he became its president. Today, the park, with the museum still as its centerpiece, is on the National Register of Historic Places. In March 1958, the first addition to the building opened, doubling the museum’s floorspace. This addition, which was on the north side of the original building, was designed by the Cleveland architectural firm of Hayes and Ruth. They designed new gallery space and a new art library. The museum again expanded in 1971 with the opening of the North Wing. With its stepped, two-toned granite facade, the addition designed by modernist architect Marcel Breuer provided angular lines in distinct contrast with the flourishes of the 1916 building’s neoclassical facade. The museum’s main entrance was shifted to the North Wing. The auditorium, classrooms, and lecture halls were also moved into the North Wing, allowing their spaces in the Original Building to be renovated as gallery space. Between 2001 and 2012, the 1958 and 1983 additions were demolished. A new wrap-around building, and east and west wings were constructed. Designed by Rafael Viñoly, this $350 million project doubled the museum’s size to 592,000 square feet (55,000 m2). To integrate the new east and west wings with the Breuer building to the north, a new structure was built along the south side of the 1971 addition, creating extensive new gallery space on two levels, as well as providing for a museum store and other amenities. Viñoly covered the space created by the demolition of the 1958 and 1983 structures with a glass-roofed atrium. The east wing opened in 2009, and the north wing and atrium in 2012. The West Wing opened on January 2, 2014. The museum’s building and renovation project, “Building for the Future”, began in 2005 and was originally targeted for completion in 2012 (though it was not completed until 2013) at projected costs of $258 million. The museum celebrated the official completion of the renovation and expansion project with a grand opening celebration held on December 31, 2013, and additional activities that continued through the first week of 2014. The $350 million project—two-thirds of which was earmarked for the complete renovation of the original 1916 structure—added two new wings, and was the largest cultural project in Ohio’s history. The new east and west wings, as well as the enclosing of the atrium courtyard under a soaring glass canopy, have brought the museum’s total floor space to 592,000 square feet (55,000 m2) (an increase of approximately 65%). On June 27, 2009, the newly constructed East Wing (which contains the Impressionist, Contemporary, and Modern art collections) opened to the public. Chester Beach’s Fountain of the Waters adjacent the museum’s main entrance in Wade Park. Wade Park includes an outdoor gallery displaying part of the museum’s holdings in the Wade Park Fine Arts Garden. The bulk of this collection is located between the original 1916 main entrance to the building and the lagoon. Highlights of the public sculpture include the large cast of Chester Beach’s 1927 Fountain of the Waters; a monument to the Polish expatriate and American Revolutionary War-hero Tadeusz Kościuszko; and the 1928 bronze statuary sundial by Frank Jirouch, Night Passing the Earth to Day, which sits across Wade Lagoon from the museum, near the park’s entrance on Euclid Avenue. Rodin’s The Thinker in installed at the top of the museum’s main staircase. After being partially destroyed in a 1970 bombing (allegedly by the Weathermen), the statue was never restored. Art historians knew that Rodin was involved in the original casting of this sculpture. The 1970 damage (noted on a plaque since mounted at the base of the statue’s pedestal) is considered to have made this casting unique among the more than twenty original large castings of this work. George Bellows, Stag at Sharkey’s, 1909. 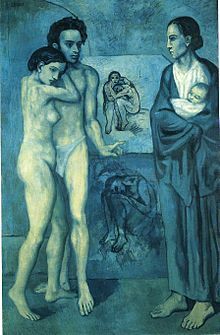 Pablo Picasso’s Blue Period piece, La Vie (1903), is one of the highlights of the museum’s Modern European Painting and Sculpture collection. The museum’s African art collection consists of 300 traditional, sub-Saharan works from the Bini, Congo, Senufo, and Yoruba peoples, mostly donated by Cleveland collector Katherine C. White. In addition to its comprehensive collection of fine art, the Cleveland Museum of Art is also home to the Ingalls Library, one of the largest art libraries in the United States. As part of the initial 1913 plan by the museum’s founders, a library of 10,000 volumes was to be assembled, to include photographs and archival works. By the 1950s, the collection of books alone had surpassed 37,000 and the photographic collection neared 47,000. By the 21st century, the library had more than 500,000 volumes (and 500,000 digitized slides); renovation of the library space was one of the focal points in the museum’s $350 million expansion. In 2008, the United States Postal Service selected the Cleveland Museum’s famed Botticelli painting entitled Virgin and Child with the Young John the Baptist as the Christmas stamp for that year. Caravaggio, The Crucifixion of Saint Andrew, Caravaggio, 1607. Cornelis Janssens van CeulenUnknown Woman, 1619. Frans Hals, Portrait of Tieleman Roosterman, 1634. Francisco de Zurbarán, Christ and the Virgin in the House at Nazareth, 1631–1640. Nicolas Poussin, Holy Family on the Steps, 1648. Andre-Charles Boulle (1642-1732) Cabinet c. 1690. Jean-Baptiste Oudry, A Hare and a Leg of Lamb, 1742. Jacques-Louis David, Cupid and Psyche, 1817. J.M.W. Turner, The Burning of the Houses of Lords and Commons, 1835. William Sidney Mount, The Power of Music, 1847. Frederic Edwin Church, Twilight in the Wilderness, 1860. Claude Monet, The Red Kerchief: Portrait of Mrs. Monet, 1868-1878. Auguste Rodin, The Thinker, 1880-1881 (showing damage from the 1970 pipe bomb). Edgar Degas, Freize of Dancers, 1895. Albert Pinkham Ryder, The Race Track (Death on a Pale Horse), 1896-1908. The Cleveland Museum of Art also maintains a schedule of special exhibitions, lectures, films and musical programs. The department of performing arts, music and film hosts a film series and the museum’s Performing Arts Series, which brings the creative energies of internationally renowned artists into Cleveland. The department of education at CMA creates programs for lifelong learning from lectures, talks and studio classes to outreach programs and community events, such as Parade the Circle”, Chalk Festival and the “Winter Lights Lantern Festival”. Educational programs include distance learning, “Art to Go”, and the “Educator’s Academy”. The museum is also home to the Ingalls Library, one of the largest art museum libraries in the United States with over 500,000 volumes.